When you have a joint account, each person on the account can transact with the account. As part of our estate planning package, my wife and I created a trust, with both of us as co-trustees (see Will and Trust Through Employer Legal Plan). We stated in the trust that each trustee can act alone. However, our IRAs and HSAs can only be in our individual names. It’s not possible to have a joint IRA or a joint HSA. We can name beneficiaries, but the beneficiaries only become relevant after the owner dies. When you are alive, a spouse does not have any authority over your IRA or your HSA unless you grant some permissions. We also executed a Durable Power of Attorney in our estate planning package. We granted the authority to act on behalf of each other in case we are not able to act ourselves. However, we also learned that financial institutions often don’t recognize these broad Powers of Attorney. They want the signatures and the language on their own forms. It’ll be a bummer when you really need to use the Durable Power of Attorney, you are only told by the financial institution they don’t accept it. If you’d like to be prepared, it’s better to sign the forms required by your financial institutions before you need a family member to act on your behalf. We have IRAs with Vanguard. Vanguard has a process for authorizing another person to act on your behalf over your accounts. They call it agent authorization. 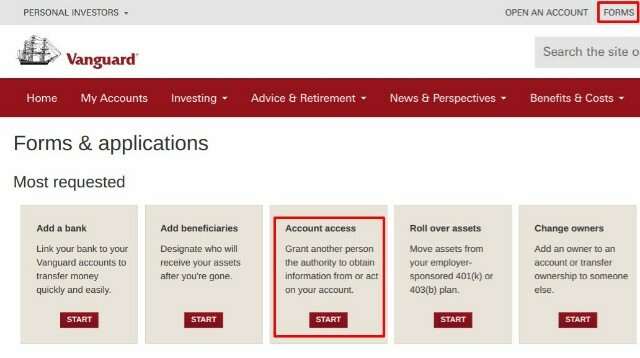 On Vanguard.com, click on Forms, and then look for Account Access. When you follow the process, you tell Vanguard the name, address, Social Security number, email address, etc. of the agent, whether you want the person to be a limited agent or a full agent, and for a limited agent, which account(s) the agent is authorized for. The agent will receive an email from Vanguard to confirm that he or she will accept the authorization. Once the agent confirms, the authorization becomes effective. If the agent has a user name on Vanguard.com, the agent will see additional accounts listed when he or she logs in. If two of you would like to make each other an agent, you will have to go through the process separately from each direction. Person A makes Person B an agent and Person B makes Person A an agent. We also have IRAs and HSAs at Fidelity. Fidelity also has a similar process. They have four levels of access (follow the link to start the process to give access to your accounts). Inquiry Access is view-only. The person with Inquiry Access can see your account balance and history but can’t transact or make any changes. A person with Limited Authority can trade but can’t withdraw from your account, make IRA contributions, or convert assets from a Traditional IRA to a Roth IRA. A person with Full Authority can trade, withdraw from your account, and initiate IRA contributions, recharacterizations, and Roth conversions. A person with Power of Attorney can do everything plus account maintenance tasks on your behalf. Granting Power of Attorney requires notarized signatures. Similar to Vanguard, Fidelity will also send an email to the person receiving the access permissions. The access becomes effective only after the person accepts the access. 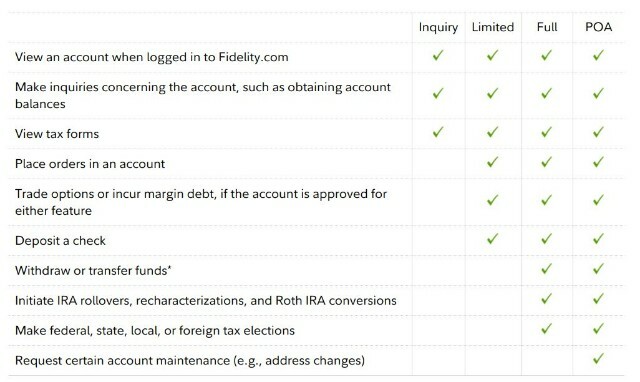 Once accepted, the person who received access will see additional accounts listed when he or she logs in to Fidelity.com. The additional accounts will be under a separate account group. You can customize the display name of each account to something that makes more sense to you. If two of you would like to give access to each other, you will have to go through the process separately from each direction. Person A gives access to Person B and Person B gives access to Person A. You have the choice to give only limited access or full access. Because we already signed broad Durable Power of Attorney we are comfortable with letting each other do everything. We chose Full Agent/Full Authority. The person who gave access can revoke the permissions at any time. If you change your mind you just follow the same process to revoke access to your accounts. Going through the official process of giving permissions is the right way to do it. Sharing your user name and password with another person can weaken your protection from the financial institution. It can also put the other person in a position that he or she can be accused of identity theft or hacking. After you grant access, each person should log in with their own user name and password. In light of elder financial abuse or scams, new regulations require financial institutions to offer the ability to designate trusted contacts. When they suspect a customer is being scammed or the customer has displayed diminished mental capacity, they will contact the trusted contact(s) to make sure the transactions are legit or alert the trusted contacts potential issues. Adding a trusted contact by itself does not give the trusted contact any permission to access the account but it can be used in conjunction with account access permissions. For instance if an elderly parent adds an adult child as the trusted contact in addition to giving the adult child permission to view the accounts, the adult child can monitor the parent’s accounts and receive alerts from the financial institution for suspicious activities. Of course the parent has to add trusted contacts before getting scammed or experiencing reduced mental capacity. * These account types aren’t eligible for the online process. To add a grantee, submit an Agent Authorization Form. The Agent Authorization Form requires a notarized signature, so it’s a little more involved but still worth pursuing. I also wasn’t aware of this, previously having to login to both my and my wife’s Roth IRA acccounts individually which was annoying. However, she was not able to grant me anything other than Limited Authority either. Great article, but Harry you need to update the Vanguard terms, as they now seem to match the Fidelity terms with the exception of POA. Rights aren’t quite the same between the 2 though it would appear. I agree with the findings of others regarding Vanguard. Assigning “Information Only” and “Limited Agent” status can be done online (I assume–I didn’t complete the process because that’s not what I want). Assigning “Full Agent” status requires a notarized paper form (can be filled out online, then printed, signed, notarized, and mailed). At least that’s what I could access within my PC’s environment (Win 10 Pro, MS Edge browser).